Anyways, when I’m not pondering the bird encounters of others – I’m having my own right here in Davis, CA. I guess that’s the thing about studying the effects of human-produced noise on wildlife: you don’t have to travel too far to do it! My field sites have been set up for multiple years and host a variety of bird species such as Tree Swallows, Western Bluebirds, and Ash-throated Flycatchers. The land is in farm country, so the sites are naturally quiet. This allows me to experimentally play targeted traffic noise (with lots of speakers and batteries) and measure a variety of behavioral and physiological responses. However, the location of my field sites also means that the land is also used for grazing sheep and cattle and I’ve gotten really good at dodging poo. Since April, I’ve been looking at the effects of traffic noise on Tree Swallow behavior and stress responses, in an effort to better understand the effects of urbanization for conservation purposes. 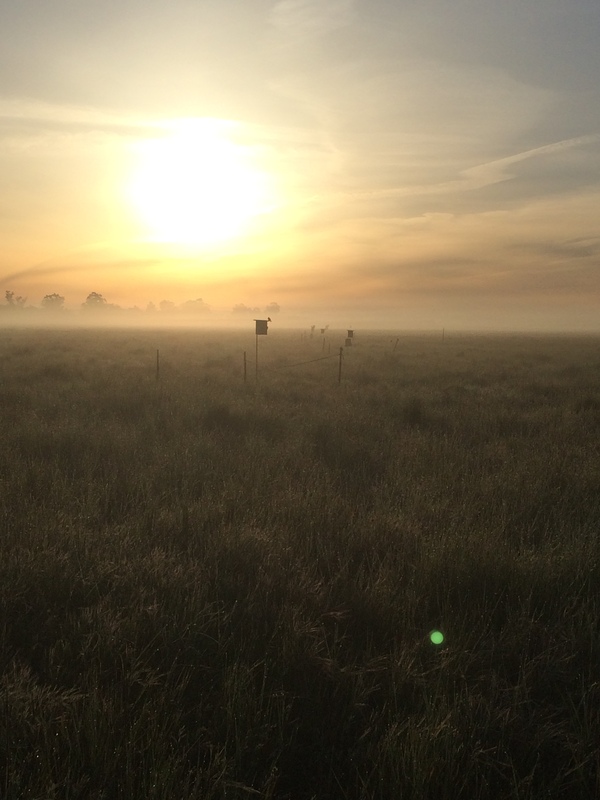 Like any field season with bird research, it’s been filled with lots of early mornings, but the peaceful surroundings at my field sites make it more enjoyable! 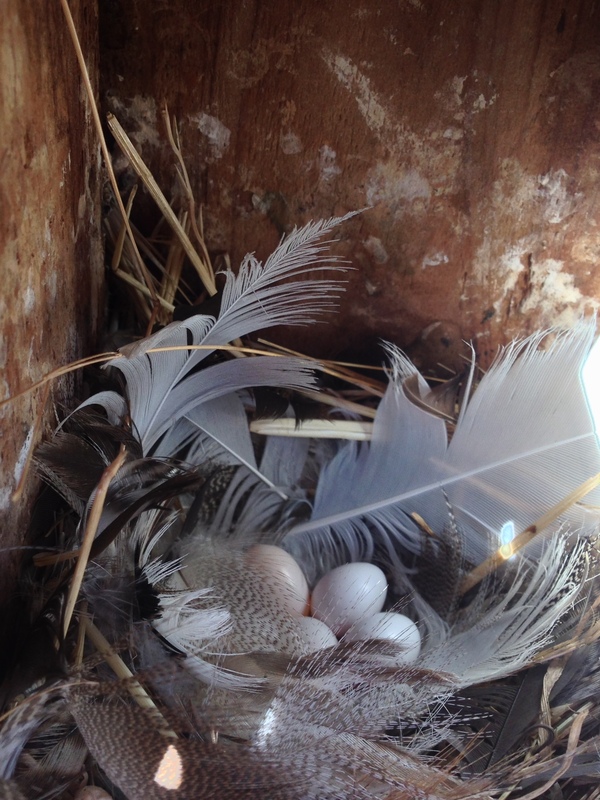 Tree Swallows are secondary cavity nesters, so they don’t create their own nest cavities. 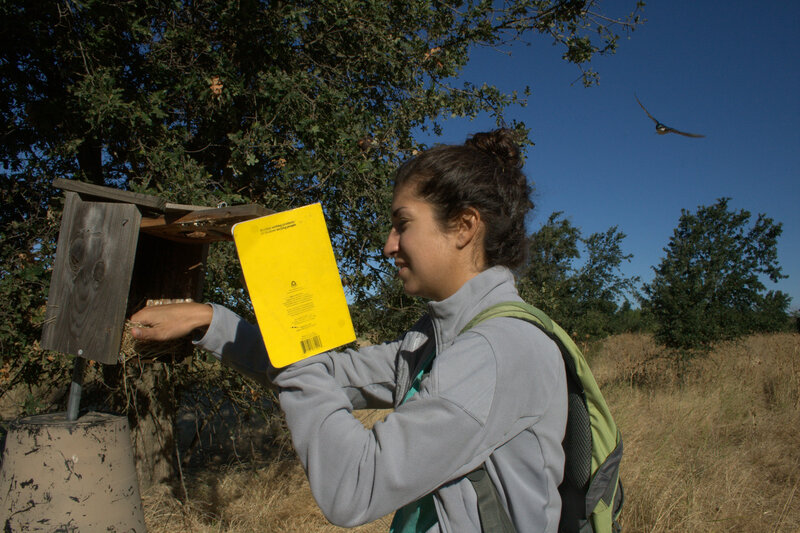 Instead, they take advantage of already existing cavities in trees created by woodpeckers, as well as nest boxes (fancy science word for bird house) set up by people like me. The birds create nests made of grass and line them with feathers. Tree Swallows LOVE feathers. They usually use the feathers of other birds that they find on the ground, but this year most birds at one of my field sites used the feathers from a down couch cushion that someone discarded on the dirt road nearby. Bourgeois birds! If you’ve never seen a Tree Swallow before, they’re quite handsome and relatively small birds. They have iridescent feathers on their back and head, with white feathers underneath. Well, that’s for the adults anyways. The nestlings are perhaps a bit less handsome and a bit more grumpy looking… but they are still cute in their own way! Their broods range from 3-7 nestlings… which is really impressive given the relative size of the female to the eggs they lay. 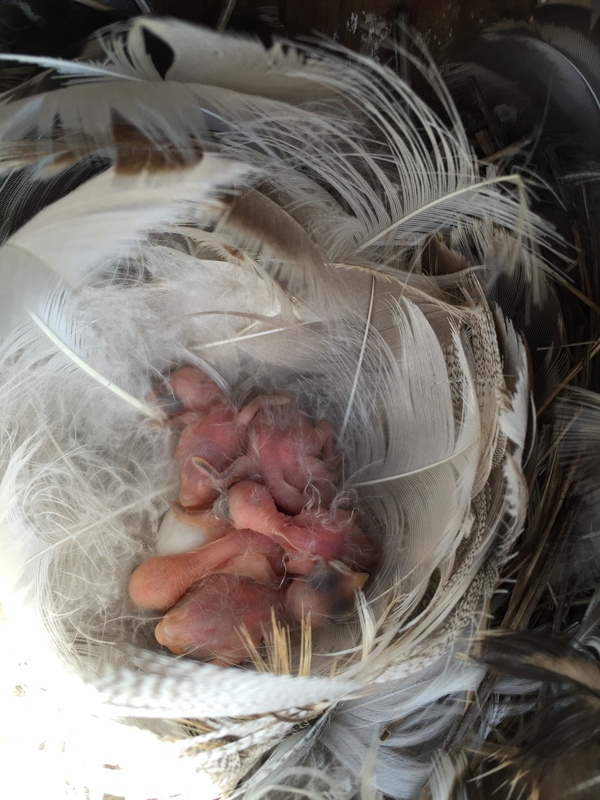 The nestlings remain in the nest for 2-3weeks, during which time they are fed by their parents. The nests are also defended by their parents, who dive bomb any predator (or good-intentioned researcher) that goes near them. Tree Swallows are aerial insectivores, meaning that they eat flying insects. Once they fledge (i.e. leave the nest box) they remain close by – and often hang out with each other! 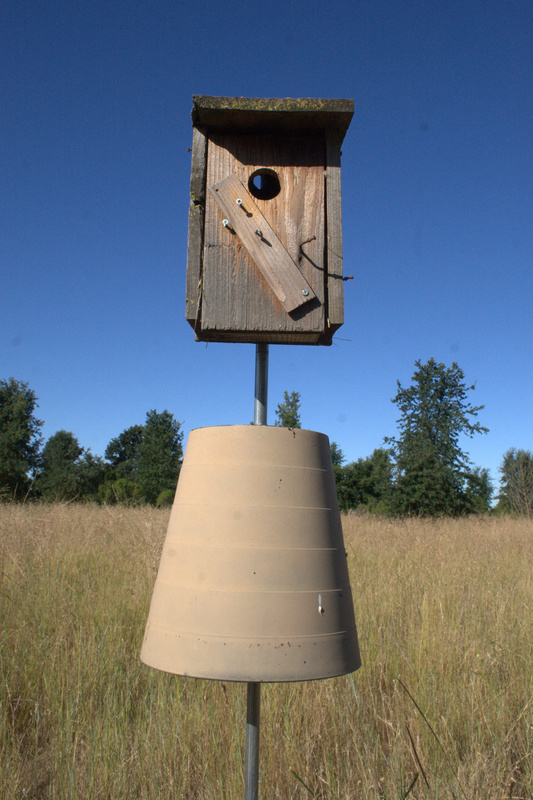 Tree swallow adult dive bombing me as I check the occupancy of a nest box. 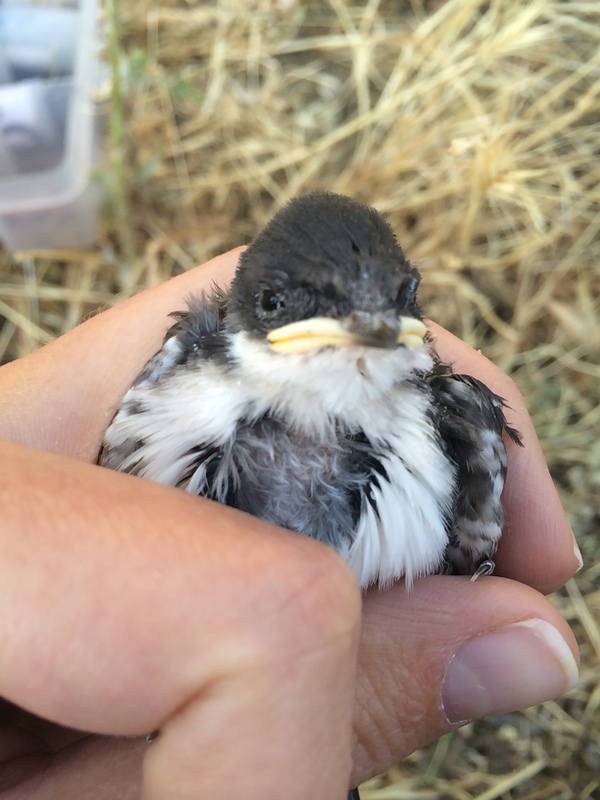 Like the Tree Swallow fledglings, I’ll also be hanging around Davis for a while this summer analyzing all of my data from this field season, so stay tuned for results! Previous Post Technically Speaking: GitHub and grad school – can you reproduce my results?